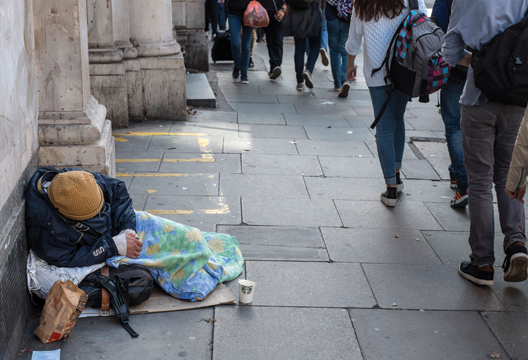 Having worked in both mental health and the homelessness sector, I have seen disparity between the way those who are homeless and those who are not get access into services. Mental health services often provide you with a surface view of what is going on for a person. Homelessness, however, gives you wider exposure to a person’s adversities, which often include complex mental health problems and at times dual diagnosis. Since working in homelessness, I have been able to broaden my scope of supporting a diverse group of complex individuals – more so than I have been exposed to within the NHS. As such, my working style can no longer be focused on a singular intervention. I consider a multifaceted package of issues including support with social skills, daily living, finance and budgeting, motivation and taking responsibility, mental health, substance misuse, offending history and much more. Essentially, my work entails enhanced support for a person to achieve a level of stable functioning following the trauma that homelessness brings. However, my biggest difficulty is advocating on behalf of such individuals in getting the appropriate level of care from mental health services. Homeless individuals are usually faced with the stigma and barrier of ‘not being eligible’ for a service due to having no fixed abode or, the unpredictability of their housing situation. I was faced with an example of this only recently, when a homeless individual who I am closely working with was discharged from psychological services simply due to the uncertainty of him moving out of the borough once he moved on from the hostel. He had been on a waiting list for over a year simply to get access to the relevant therapeutic intervention that he needed. The sector is in crisis due to the increased number of homelessness, rough sleeping and those living in temporary accommodation. How can we resolve this issue? Are there better ways of enabling access to mental health treatment for the homeless? Or, are we sadly adding to the unconscious bias of how homeless people should be cared for?